There are different things which could cause one’s eyes to be bloodshot and these ranges from environmental pollution (smoke, exhaust fumes etc. ), screen light exposure (computer), a chlorinated pool or lack of adequate sleep which could get the arteries in the white part of your eye dilated; making it more distinct than the other part of the eyes. All of the aforementioned effect could get the eyes irritated making your eyes feel gritty, watery. Inflamed and itchy. 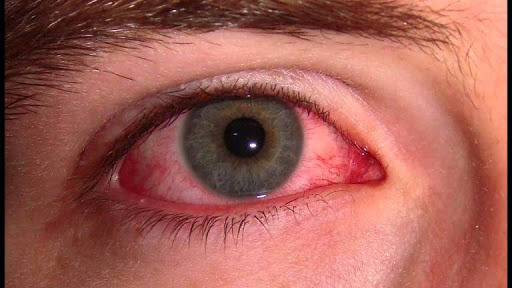 You could begin to feel a burning sensation and eye discharge, swollen eyes, sensitivity towards light and falling eyelash. Take frequent breaks from highly illuminated screens such as the laptop, televisions, mobile phones etc. Ensure that you get enough sleep so as to avoid bloodshot eyes; avoid repeated late night sleeps. When embarking on long distance drives, ensure that you take a break at least every three hours to avoid having a bloodshot eye. Make sure you put on glasses to prevent the chlorine in the pool from irritating your eyes when swimming. Avoid staying in an air conditioned environment for a long time; this could make the eyes dry and irritate it, you could control your room temperature using a humidifier; this has a soothing effect on the eyes. Excessive makeup on the eye could irritate the eye and make it bloodshot. Ensure that you do not wear to bed heavy makeups on your eyes, clean up before retiring to bed; remove artificial eye lashes, eyeliner and mascara. This help to maintain and keep your eyes moist and prevent redness, particularly when you are working on a computer or driving. Use sun glasses which could help to protect your eyes against the sun so as to reduce the sensitivity of your eyes to light. Wash your eyes frequently with clean water; this will help to remove germs, dust and pollutants from the eyes. Keep your hands away from your eyes; this could cause eye infections, particularly when the hands are dirty; this could expose your eyes to germs. Use some natural lubricants that are really beneficial to the eyes, this could help to bring proper relief to the eyes, reducing redness and puffiness. The eye is a very important part of the human body and it should be treated with a lot of care ; much attention should be paid to it because sight is light. All of the aforementioned would help you maintain a healthy eye care and they are really important in reducing eye infections and bloodshot eyes.